“A mounting body of evidence points to a recurring pattern in which insecure property rights and political disputes cause initially euphoric global investors to cancel proposed deals or walk away from farming projects across the continent,” writes Till Bruckner in Foreign Policy. If true (still a big “if”), this would be cause for some relief, but should also serve as a wakeup call. The inclusion of land tenure under three of the new Sustainable Development Goals adopted by the United Nations last year will also help us gain traction on this. A land target under the poverty alleviation goal, end hunger goal, and gender equality goal will help spotlight the need and measure progress. If indeed we are seeing a pullback from large-scale corporate land investments in Africa, this is certainly cause for relief. But it should equally serve as profound affirmation of one of the biggest barriers holding back more equitable, bottom-up development on the continent. Chris Jochnick is CEO of Landesa, a global non-profit that works to strengthen land rights for women, men, and communities. Sources: The Brookings Institution, Foreign Policy, Landesa, Oxfam, Prosterman et al. (2009), UN Food and Agriculture Organization. 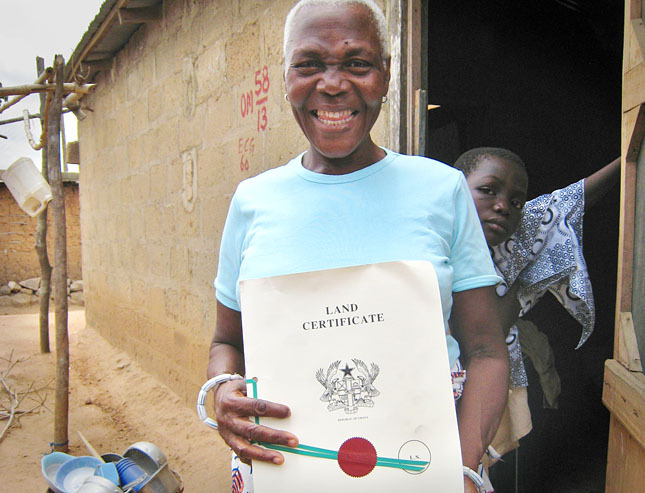 Photo Credit: A woman in Ghana displays the certificate to her land, used with permission courtesy of Deborah Espinosa/Landesa. If insecure tenure is an impediment to both farmer and transnational capital land investment, could documenting farmer landholdings then ultimately (and perhaps unintentionally) facilitate corporate land grabs (and/or the slower displacement driven by expanding agro-industries)? The answer is ultimately yes, which is why strong legal recognition and enforcement mechanisms for individual and community land rights are very important. Thanks. As someone knew to this field, could you (or someone) by chance point me in the direction of some solid case studies reviewing successful smallholder titling projects? Up to this point I have only had a chance to review a few documenting mass dispossession following titling efforts (esp. in Guatemala). I recommend that you look into experiences from Kyrgyzstan, Rwanda, and even Japan. For a primer on land tenure and smallholder land rights, read One Billion Rising.